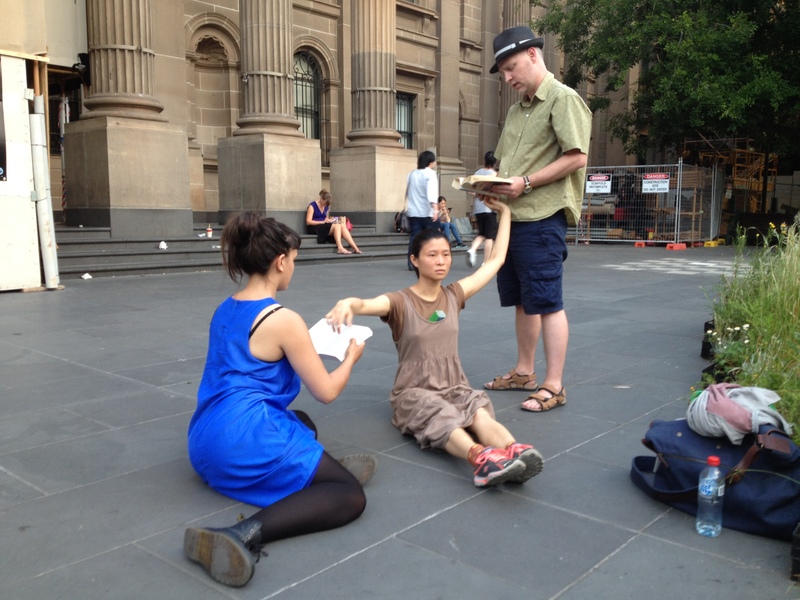 SLV-Wake was performed again in front of the State Library, but this time beginning in the early evening. This time Chun-liang and I were joined by Shani Holmes. The concept behind this improv was to use Finnegans Wake as source material and inspiration. The idea was that Shani and I would read from the text (Shani sometimes singing it), whilst Chun-liang interacted with us in movement, etc; she’d also read from the text during the week and took inspiration from it (I had bought them each a copy). It was different from our last State Library performance. There was a very loud busker on the footpath that we had to contend with most of the time. We mostly stayed on the pavement in front of the library entrance, rather than the grass. We had quite a good ‘audience’ at this particular location (people who had come to actually see us, and passersby moving in and out of the library entrance, often stopping for some time to watch). I did find myself speaking loudly/theatrically a lot, trying to be heard over the busker, in retrospect I think it would have been OK if I couldn’t have been heard at times. I also need to have few instruments for such performances, or at least come up with a different method for carrying them around/accessing them, as rummaging through a large bag detracts from performance and the whole look of us theatrically. But despite these misgivings, again this was a really inspiring and exciting performance to be a part of. Shani was a revelation – despite her saying she was nervous beforehand, she really threw herself into the performance, vocally and physically. And Chun-liang was a joy to work with again – really challenging physically (moved me around physically a few times, stepped on my stomach!). We performed for close to two hours, including warm-up. I was quite surprised about this duration afterwards, it didn’t seem that long to me. 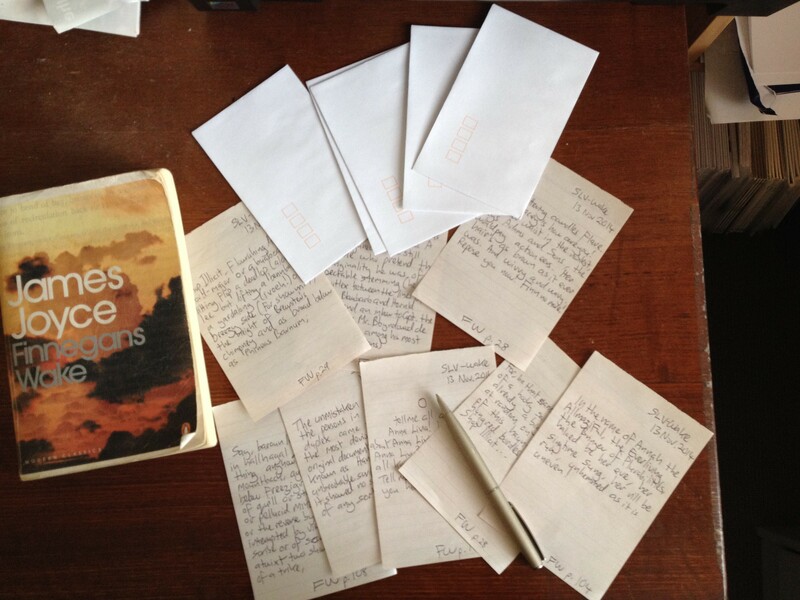 I had prepared an interactive element by writing quotes from FW on pieces of paper and sealing them in envelopes (about twenty all up), which I gave to audience members and passersby, whilst reading a quote regarding The Letter from FW in a low voice to each of them. Some did not accept the letters, and I did not force it on anyone, but most did, opened them and read them. Chun-liang and Shani opened theirs and incorporated the reading of them into their performances. When we started at about 7:30pm the light was bright. Throughout the performance, the light faded significantly, as the photo gallery shows. By the time we left at about 9:30pm, it was well and truly dark. The change from day to night was very appropriate given the Joycean material. We chatted with some of our audience for a while, then the three of us went and had a meal at Stalactites, each of us exhausted.